Thandisizwe Chimurenga spoke to CSUN students about forgotten African-American female victims of police violence in the USU on Feb. 23. Photo by David J. Hawkins. 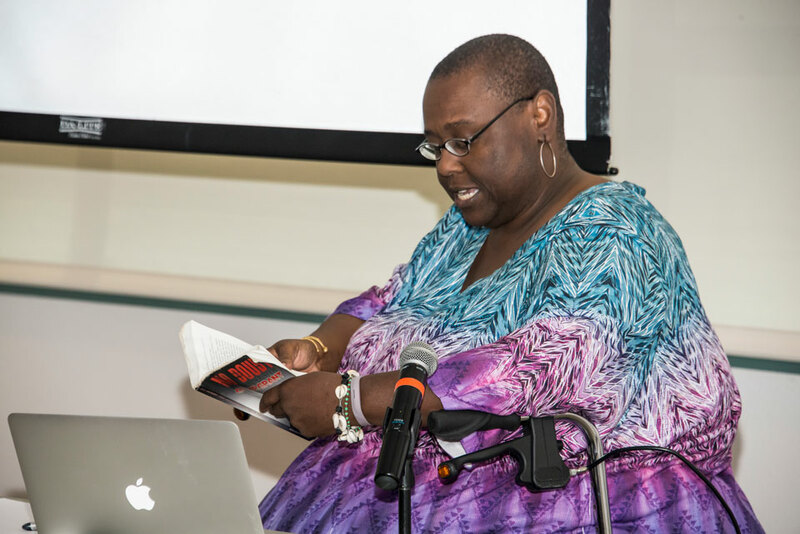 Local journalist and community activist Thandisizwe Chimurenga visited California State University, Northridge on Feb. 23 to share the stories of African-American women whose deaths at the hands of police officers and other law-enforcement officials have gone mostly unnoticed by the general public. Held in the University Student Union, the forum, #RememberHerName – Excavating the Black Female Victims of Police Terror, was part of CSUN’s commemoration and celebration of Black History Month. Chimurenga, author of No Doubt: The Murder(s) of Oscar Grant, also spoke about the reasons and issues behind society’s ambivalent police violence against black females. “The difference between the outrage and the response in terms of the deaths of black men and the deaths of black women is the deliberateness of black men’s deaths, versus the appearance of an accidental death for black women,” Chimurenga said. She cited several disturbing examples: A law enforcement officer entered the New York apartment of Eleanor Bumpurs in 1984, to check on unpaid utility bills. Bumpers, 66, who was mentally ill, attacked the officer with a butcher knife. Instead of disarming the woman, the officer shot and killed her. In 2010, 7-year-old Aiyana Stanley-Jones was shot and killed by a Detroit police officer who was initially looking for a criminal suspect (allegedly hiding in Stanley-Jones’ apartment). In 2015, Yuvette Henderson was fatally shot for shoplifting in Emeryville, Calif. Police officials said the 38-year-old held a gun, but witnesses reported that Henderson was unarmed at the time she was shot. In the same year, 27-year-old Natasha McKenna died in police custody after she was tasered during a mental health breakdown. Chimurenga highlighted other cases of African-Americans, such as Oscar Grant, whose death in Oakland, Calif. on New Year’s Day 2009 followed an officer-involved shooting that was filmed by onlookers and went viral. While African-American women suffer just as much police violence and mistreatment, their cases are largely ignored, Chimurenga said. “A lot of times, the narrative of black women becomes one of, ‘She’s just crazy,’” she said, explaining that the violent deaths of African-American women don’t receive the same public outcry as similar cases involving their male counterparts. According to Chimurenga, this indifference stems from male-dominated culture and the patriarchal U.S. society — where African-American women are discounted based on their “double minority” status: race and gender. Images and cell-phone videos of male victims have sparked widespread public protest and outrage, but the same is not true for female victims, she said. After Chimurenga’s talk, students engaged in a lively discussion to develop potential solutions. Africana studies professor Sheba Lo said it’s important for students to engage in dialogues of credited forums like #RememberHerName as informative conversation starters with community activists, scholars and leaders.